Even though I got home earlier than anticipated on Sunday, I was still really tired on Monday. The kids went to camp and I did nothing. I didn’t work out, I didn’t unpack, etc. I showered and I ate when necessary and it felt like an accomplishment. I was looking in the pantry for lunch choices when I happened to glance up, and I might have growled. My biggest complaint for the conference is that there is no water readily available to drink. If you searched you could find coffee, but there was always lemonade (with sugar), sugar free fruit punch and unsweetened iced tea. I tried the fruit punch once, but confirmed that I’m really not a fruit punch enjoyer. So if I couldn’t find coffee or if I didn’t have time to run down to the cafe to grab water, I’d grab that iced tea, throw a sweeetener in it, and off I’d go. I also kept getting these sporadic 300s. Then came the day I was stuck in the 300s, going to emotional sessions, and chugging iced tea to stay hydrated. I was in a session with some of my favorite people and at the end someone mentioned being stuck in the 300s, and I yelled “me too!” We figured out everyone who was high was drinking iced tea, so someone tested it and all the meter said was HI. Kerri had me talk to the food guy (no really, Kerri yelled “Briley, come talk to the food guy!”) who was pissed, and asking me where I got my iced tea. All I could say was that I had gotten them all over the place through the course of the week, and that I had had sporadic 300s. I told him I had also gotten it in the cafe, which is also labeled as unsweetened. At some point later that day I completely lost it. It was not the iced tea’s fault, but the lingering high blood sugars and the frustration that comes with it were definitely part of the problem. 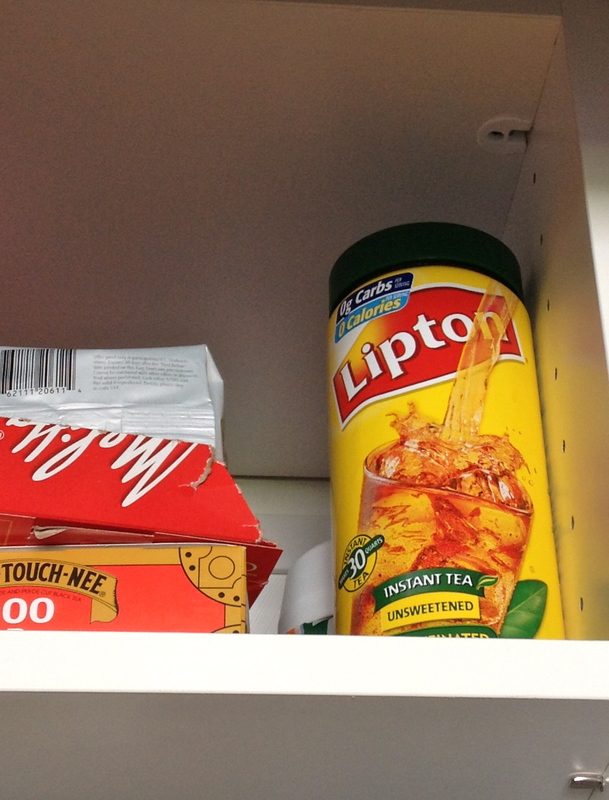 I am guessing that this container in my pantry is fine, but I still cannot bring myself to drink it. Grrrr, rogue sweet tea masquerading as unsweetened! Hate it when that happens.